Now that I'm in training for my new collection, "Moccasin Square Gardens", with Douglas & McIntyre, I'm in what I call the "Eye of the Tiger" stage where I watch a lot of music videos, lean in to listen to conversations I probably shouldn't be listening to (I'm a slave to eavesdropping) and reading work that just gives me a perm 24/7. Here's my go to list right now. Don't tell anybody. 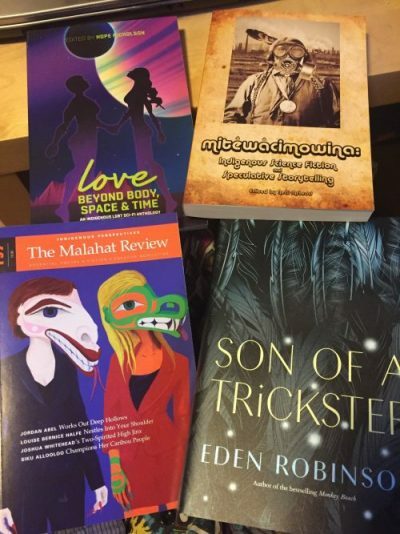 1) The Malahat Review: the Indigenous Issue. Yes, I was the judge for fiction and yes we received over 25 submissions and yes I just died a little when I found out I could only choose 5 stories (lame), but I did what I had to do and chose "the swooners." That's what I call them. Please keep this under discretion. It was hardship. But I just look at this cover and glance through it and, well, the magic happens. I catch the scent and I can dive back face first into my treasure of stories that I'm composing and it's just fantastic and embryonic. Hey you didn't just whisper, "More like moronic", did you? 2) Eden Robinson: Son of A Trickster. Book of the Year! Book of a Lifetime! And it's the springboard for a trilogy. Are you kidding me? This takes Indigenous literature to a whole new stratosphere. We'll all be held to this level for a good long while. It's phantasmatonic. I actually had to invent a word to kind of even catch up to the space station that you'll need to get a glimpse of the Haisla greatness that Eden composed yo! Get to it! What? You have better things to do than have soul pulses? Whatever! 3) Love Beyond Body, Space, and Time: An Indigenous LGBT Sci-Fi Anthology, edited by Hope Nicholson. This is just a starburst of glory and fun and sensuality and soul bliss and napping in a sunbeam with a fox tail upon your lover to tickle you awake, you little miracle-omeaboa! Whoah. Wait. How do you even spell that? Omeaba? What the actual what? Okay, so, yeah, I wrote my greatest short story ever. Well, okay, it is one of my sveltest. And it's all because I was in great company with an incredible publisher and I just gave'er through the gates of glory with "Aliens." Check it out, Peoples (please)! 4) Mitewacimowina: Indigenous Science Fiction and Speculative Storytelling - The Theytus Books anthology of sci fi and spec fiction. Holy canoley, Lee Maracle melted my skin off with her first story and I'm still recovering. There's some dark storytelling in there but there's also casual cool stuff, too. It would be like camping with Nostradamus and a bunch of cool Indigenous people around the campfire who can just outdo each other with stories about the Sky People and the end of the world. Pack your bannock-in-a-bag and ratroot because you're going to have to bare knuckle brawl your way through what's coming. A lot of it is not good, according to my cousins, but, well, we're all fighters when we need to be. This is glorious sunwarrior stuff that I'm not even supposed to be talking about but it is all so glorious I couldn't even stop even if I tried. Happy reading and here's to those who inspire us to do our very bestestes every single day!